St. Hilarion Castle According to a legend, the castle is said to be named after a holy man and hermit who lived there for the last years of his life and is said to be buried there in the 8th century AD. A church was founded on his grave and later a monastery was built around it. In the 10th century a castle was erected around this area as part of an early-warning system. The Lusignan rulers used it during the Middle Ages as a summer residence after which Venetians took over. 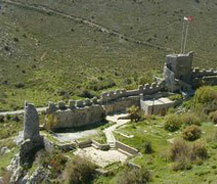 Besides its enchanting historical background, the wonderful views from St. Hilarion castle are not the be missed.